full blown game/simulation or virtual reality type immersions. Of these, the most widely used is, unfortunately, the page turner. Anyone with a PowerPoint presentation can easily and inexpensively convert it into online learning. This can be done using any one of a plethora of tools. Name an organization that does not have PowerPoint as part of its standard load on user’s computers. It’s hard to avoid thinking in PowerPoint-ese. Given this profusion, it is easy to see that a PowerPoint presentation is simply converted and becomes the de facto online learning style used. Moving on to the next level is the limited interactions style of asynchronous online learning. By forcing the learner to interact to obtain some type of information you can improve the overall experience of the learning. Generally, this is done by inserting a hyperlink or image link that presents additional information. There are many iterations of this type of interaction - click on something to read or listen for more in depth information. Creating this type of learning can be done with limited programming skills. In fact, it can be done using some more advanced PowerPoint skills. More often, the instructional designer will use a more advanced type of rapid development tool to create this. Branching and scenarios that cause a learner to make decisions increase the knowledge retention even further. We have now generally moved out of the PowerPoint based online learning courses. Depending on the complexity of the scenario and branching data being tracked, an instructional designer can certainly create quality learning using rapid development tools. The more complex the course, the longer it takes to program. Using a "canned" branching or scenario based interaction provided by the tool can work, however, in my experience, each interaction needs to be heavily modified in order to meet the demands of the concept being taught. This is generally done by programmers working in conjunction with an instructional designer. Finally, game and world development provides incredible interactions that are not scripted, especially when artificial intelligence is used. This gives learners the best of real-world situations in which to train. Chapman Associates releases studies of costs associated with these different presentation forms mentioned above. In 2010 the average development cost ranged from $10,000 to $53,000+ per seat hour depending on the type of presentation format. Clearly, time and cost to develop are major factors in choosing the right presentation form for your courseware. I've used numerous tools over my 15+ years programming online learning. I am a technical director charged with leading a team of programmers, graphics artists and game developers who work hand in hand with a cadre of instructional designers and project managers to deliver high quality online learning to our clients. My team is constantly looking for ways to decrease our overall development costs while increasing the quality of our products. As such, I constantly evaluate and change out the toolset we use. 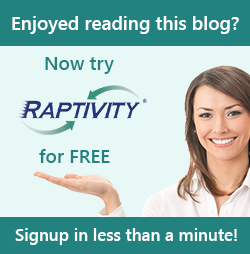 I've recently started using Raptivity. This is a tool that I feel gives the instructional designer or subject matter expert the ability to create quality and engaging interactions that are not repetitive - 180+ interactions that can be modified - without programming. I've never seen a development tool that provides the breadth and depth of interactions this tool has. An example of a flash card based interaction that can be published to either Flash or HTML5 is shown in the image. 180+ interactions seem like a bit overwhelming? I started with Raptivity’s Essentials pack and attended one of the numerous webinars that are always available. Raptivity’s help tool also has a multitude of examples on how to use the interactions that I’ve taken great advantage of. I’ve also connected with Raptivity support and found the support team to be very knowledgeable. Next up – “Getting Started with The Essentials Pack in Raptivity”. I look forward to an engaging series of comments and discussions from these blogs.